Tired of fad diets? Tired of low calorie, low fat, low carb, eat this not that types of diets that may work in the short term, but are not sustainable? Eating clean is a lifestyle that stresses eating healthy, whole, unprocessed food. It is a way of eating that nourishes your body over the long term. The steps are very simple, and the benefits to your health are tremendous. 1. Avoid packaged and processed foods. Processed food is the cause of obesity in America. These foods have all the nutrition processed out of them and are just empty, bad calories, which have no value. They are also high in sugar and sodium, which packs on excess weight. White flour, bread, pasta, cookies and crackers have no place in Clean Eating. You can eat canned or frozen fruits and veggies, but watch for added sugar, fats, and salt. 2. 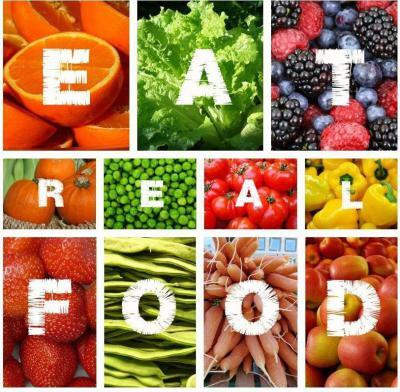 Choose real, whole foods. Try to choose foods that have 6 or less ingredients that you recognize and can pronounce. Fresh fruits and vegetables and healthy proteins. 3. Reduce or eliminate added sugars. Sugar causes inflammation in your body. Almost all processed foods have added sugar; and low fat processed foods have additional added sugar to combat the lack of fat. 4. Avoid trans fats, limit saturated fats. Processed foods are our primary source of trans fats. Fatty meats are a source of saturated fats which you should try to limit. Fat from avocados, nuts, extra virgin olive oil and coconut oil are considered "good" fats and are okay to consume. 6. Make vegetables your largest serving at meals. Use meat as a side dish. Meat is a good source of protein and Vitamin B12 and should be a side dish to the "meal", which is vegetable based. Whole grains like quinoa, steel cut oats and freekah provide fiber and help slim belly fat. Alcohol converts to sugar in your body. Save it for special occassions. 9. Eat something every two to three hours, so you are eating five to six small meals a day. Eating every couple of hours keeps blood sugar levels stable and will keep you from reaching the "I'm starving and need to eat something NOW!" stage. 10. Combine lean protein with complex carbohydrates at each meal. This controls blood sugar spikes and helps you maintain energy levels. It keeps you full longer and controls your appetite. 11. Drinks lots of water. Lots of water. Many people are in a constant state of dehydration. Water hydrates the body and keeps you full between meals. Most people skip breakfast, but eating jump starts your metabolism and keeps it going throughout the day.